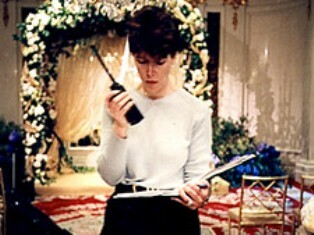 Wedding coordinators who take over the tasks and functions normally done by the church workers. The diocese would rather limit the intrusion of wedding coordinators on the roles of the mother-butlers, usher-greeters. Apparently, it has come to a point where the wedding coordinators sometimes dictate how the wedding would proceed, much to the consternation of the officiating priest. Whether called wedding coordinators or wedding planners, these wedding assistants have become a boon-and-bane to church workers. I do understand the diocese sentiments towards the couple personally appearing to the parish secretary for the forms and paperwork required. After all, it's them who are getting married, not the wedding coordinator. However, I also understand that wedding couples pay big bucks to these wedding coordinators to make their lives easier especially when time is a premium, e.g. sacrificing vacation leaves from work. When wedding coordinators advertise that they'll do all the legwork for the wedding preparations, many wedding couples are willing to pay them extra. Wedding coordinators have become the boon-and-bane for volunteer church workers. The church workers I'm specifically referring are the usher-greeters and mother-butlers. Boon, because the team of the wedding coordinators have become very good in making the movements of the functionaries (secondary sponsors) efficient. Oftentimes, I see them coaching and directing the candle, veil and cord sponsors with their tasks well ahead before I even call these secondary sponsors. Same thing with the ring, arrhae and bible bearers. The coordinators are also proactive when preparing the entourage formation at the church main entrance doors. They're there guiding the entourage in the wedding procession, sometimes even ushering the guests to their seats. I'm all for efficiency. But the wedding coordinators become a bane when the church workers assigned to the tasks become complacent. When the some usher-greeters and mother-butlers see the wedding coordinators busy with the wedding procession preparation, they no longer put in the effort. In several occasion, I see some of them just lounging at the front pews, reading or chatting with one another and simply waiting for the wedding procession to start. The diocese's stand here is that wedding photographers be reminded with their movements in order not to distract the attendees and disturb the solemnity of the wedding mass. My simple rule of thumb here is that the sanctuary is off-limits to wedding photographers and wedding coordinators during the wedding mass. I can't remember the number of times when I had to tap a picture-taker on the shoulder and direct him/her to stay on the steps and not on the sanctuary. This was raised during the Question and Answer portion of the seminar. This is my beef with the wedding entourage - tardiness. I've even highlighted this bad habit here, here, and in the worst wedding ever. Here is how one worker in another parish handles wedding tardiness. This is tardiness not caused by the parish. The priest will not deliver a homily for the wedding couple. No homily, no processional and no recessional. The entourage will be asked to go directly to their seats. There may be picture-taking afterwards up to the time their slot is finished. Then they will be asked to leave. No homily, no processional and no recessional, and no wedding mass. Just like the first two, and there will be no wedding mass. Only the marriage rites will be administered. By the restrictions the church worker imposes to the wedding couples, I'm assuming their parish only allots one hour for each wedding. Still, I favor these kinds of sanctions if only to instill discipline and order for couples seeking to be married.